← Volunteering Overseas: the best method for creating new aid workers? I agree with all of this! I’ve never worked with a consultant who I thought did a good job, sad to say. Maybe you’ve just been recruiting the wrong consultants. I have worked with many consultants who have helped much in my programs. I have been a consultant for 11 years. I have had my share of good work and ordinary work. Never has it been one-sided. After all you cannot clap with one hand. There are clients who bring out the best and the worst in consultants, as you know yourself I am sure. In principle I love the concept of ratemyconsultant.com. I have used it for things like tools and guidance material. Crowdsourcing has its strengths no doubt but in this case there is a huge possible negative. How often do you think a client will rate a consultant as ‘good’ when the consultant has submitted an adverse evaluative report? Or rate the consultant as ‘good’ when the expectations on both sides were not matched? It is difficult to be objective about these things and if you try and get to be objective, it becomes mechanical and defeats the purpose. Having said that, there is need to eventually reduce dependence on consultants except when a task requires an external and unbiased perspective / skill. I certainly take your concerns about ratemyconsultant.com. Perhaps we also need a ‘ratemyclient.com’ to even things out? Or a clear guidance at the top of every page – if a client has only ever had positive feedback, you should never consider hiring them! Thanks for the post. I’m all for slating consultants, of which I am one, as the majority are caveated yes men – ‘everything’s very good but here are a few small improvements’. That about summarises most consultancy outputs no matter what they’re inputting into – not me, obviously! I share Makarand’s concern about ratemyconsultant.com – given the above it risks consultants becoming even more placatory and ineffectual. In the world of consultancy, ‘the customer is always right’ mantra creates the opposite incentives from those which will improve practice. A couple of points on the staff investment thing though. One is that I agree with the perversity of the new public management drive to ‘decrease overheads’ while increasing actual cost. The difference between real and perceived ‘value for money’ seems lost in the political agenda. The other unfortunate reality, however, is that the gaps *supposed* to be filled by development consultants are genuine gaps in many developing countries. I happen to believe the gap could be narrowed by opening the search parameters (fewer development duffers, more varied recruitment strategies etc) and engaging in more rigorous testing. But the fact remains that there will always be a skills shortage and good consultants have a role in filling it. Thanks. I agree there will always be a role for consultants – including filling skills shortages. Having said which, I suspect the aid world does contribute to these skills shortages in many developing countries – good government staff leave their work to become NGO/donor staff, at a much higher salary. Consultancy is part of that system, though of course not the only part. (Per diems are also worth a mention here.) However, this is all really based on my biases and expectations – would be interested to see more rigorous research on the role of consultants and others in filling skills shortages. Agreed, most consultants are rubbish. That said, most organizations are clueless at how to hire and effectively employ consultants, so it’s an even match. The sector has in essence honed a philosophy of ‘consult-and-run’ and never considers how to engage consultants in an accompaniment process over the mid-term. ratemyconsultant.com is a solid idea, no particular reservations- but what really needs to change are the co-designing of contracts/engagements and ensuring that consultants are kept onboard beyond the delivery of a outputs. This is a really useful article. The question of rating consultants presents a dilemma that we at gharkamai.com have been dealing with for awhile now. Please keep in mind, however, that the label of ‘consultant’ is also given to the many women who choose to do project based work rather than a full-time job so that they can be onsite caregivers for their young children. In our experience, these women bring to the table anything that a full-time development employee brings and more. They have the expertise but with humility, and they have commitment without the politics. Not to mention they are almost always underpaid. Thanks gharkamai, that’s a really important point. Consultants are not always overpaid! I have a friend who is kept as a consultant because it allows the organisation to pay her less and avoid various employment legislation. She’s not a single mother, but your point is still relevant! What context /country are you writing about? Although gharkamai.com is based in India(hence Gharkamai- which translates to home earner) we have people registering from all over, Canada, England, U.S. and even Pakistan. You are right, though, to point out that the Indian subcontinent offers a completely different context. Very thought provoking article! I am a consultant working in public health and I runs small consultancy firm. We have had some great consultants and some terrible ones, and some great clients adn some really terrible ones. Lots of my colleagues in full-time work yearn for the freedom and flexibility they see in consultancy and lots of my consultant colleagues yearn for the certainty and stability of paid work. The hardest thing for us as a small firm has been to convince clients to let us work with them as consultants in small teams over longer time periods, so the client gets a range of skills and some long-term continuity in its technical support. Most clients want a single consultant for a short period and the mechanisms for striking up a longer-term skills-sharing and capacity building arrangement seem to complex. When we do get a long-term agreement and are able to tailor a small team of consultants really closely to the needs of a client, we seem to get much better results on both sides. I love the idea of a Tripadviser page! Interesting approach. If you or anyone else reading would like to write a blog on how organisations can best use consultants, we’d welcome it! Great post – I had a very similar thought when I was in DFID… Although actually my perspective was (and remains) somewhat more driven by the issue that consultants/advisors from emerging economies, that could arguably offer a lot more value for money and high quality advice than consultants from developed countries. In any case, it seems like a gap… Maybe ratemyconsultant.com or ratemytechnicalassistance.com would fill it:… https://dfid.blog.gov.uk/2013/04/18/can-we-accept-negative-feedback-on-our-knowledge/. Thanks, it’s nice to see the tripadvisor idea expanded so clearly! I think your blog was great. On the challenges of increasing the use of consultants from emerging economies, that’s certainly important. I wonder if the failure of development organisations to effectively use emerging market consultants is related to the other problems we’ve discussed. Consultants are sometimes implicitly required to read the minds of clients who don’t know exactly what they want, and who over rely on superficialities such as quality of English and formatting to assess the quality of work. These both favour Western consultants. I have over 20 years of experience in both sides: as client hiring consultants, and as technical consultant in development projects in a top four consulting firm; as well as an officer in a development bank and a U.N. agency. Noticed that very few international consultants with experience are overpaid, but there are a lot of improvised people trying to become development consultants. Job boards at web sites like DEVEX and Development AID among others have inflated the perception of job/work availability, bringing almost any unemployed people (young and old) into offering their services to international development projects, believing that there is a growing market in this field. E.g. at DEVEX over 50% of offered jobs are for proposals that may or may not materialize, not real jobs. You can verify this comparing the job description of several vacancies that are very similar- with different titles and employers- but in the same country. This contributes to intense competition and lower fee rates for international development work. Clients want to pay very low fees because for every vacancy they get hundreds of candidates. Quality and impact is secondary versus saving budget or increasing margins to their companies. Now, working as a free lance, clients recognize my experience, but have been offered many assignments by “consulting” firms (mostly from Spain and southern Europe) with monthly fees in the range of 2,000 euros. Of course, I declined them, but other people accepted and did a poor job without consequences. A web site grading employers and contractors in the international development field would be very useful. I appreciate the topic and the many good comments. If we could peel back the onion one more layer, I’d be interested if anybody has tried to categorize the types of consultants. 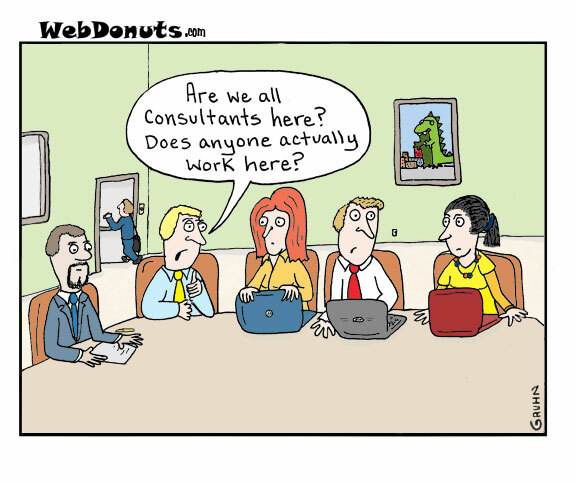 For example, the type of consultant I run into most often is the one pursuing / preparing for the next big RFP. I’d like to believe their end goal is good development, but it clearly is not. Their end goal (and that of the client) is to secure a massive contract. Once secured, many more consultants are hired because the client is living project to project. The client isn’t building a first rate development organization. They hope that happens, but the immediate task ahead is how to quickly ramp up or down – depending upon where they are in the project life cycle. 1) experienced, end of career- consultancy offers more money and more variety. I also agree the comments have been great, so thanks to you and others for contributing! You might enjoy AID LEAP’s latest entry on whether development consultants are overrated, overpaid, and overused. Reblogged this on Public Health Freaks Consults Blog. I have been both a consultant and staff member at different stages of my career, one experience feeding the other I must say. There is a degree of learning through exposure to various, short-term consultancy positions that should not be underestimated. That’s said, I agree with most of what you suggest – though I think it should be nuanced somehow. As a consultant I was very often commissioned last minute for daunting tasks – that were not or could not be addressed on time by the relevant staff or team. Challenging, and besides I often found that there was little consideration given to the work of consultants – no response on time-consuming applications, limited feedback, last minute requests for a suddenly “urgent” assignment (months after the application), “firm” commitments cancelled at the last minute etc. Consultants have some freedom and flexibility, and are generally well paid (if you don’t consider the perks that staff members have), but once you’re in those shoes you also have to cope with the stress to deal with high insecurity, delivering on short deadlines and effectively demonstrate value for money, which is eventually critical for your reputation. There are performance assessments on the other side, but the type of pressure is just not comparable. Consultancies are a two-way street, and there is not much a consultant can do on his/her own. If this is about filling gaps that could/should have been addressed in other ways, then questions should also be raised about the effectiveness of internal planning, individual performances etc. within the recruiting organization. There is also, as you rightly suggest, a tendency among institutions to privilege “flexibility” (not to say precarity) over longer-term commitments. The ratemyconsultant.com would be a great way to ensure that individual efforts are well recognized, and also provide a recognition of expertise, in a competitive environment (if comments can be addressed with a right to respond, like in TripAdvisor). However, addressing the work ethic and performance of consultants alone might not be the most effective solution to address some of the issues you’re pointing at. Lol..sounds like a staff member is pissed off at someone coming in and doing their job. If the staff members did their job where is the need for a consultant? Also don’t blame the consultant blame the system and donors that want lower management costs and more money on projects etc. .internal staff capacity building is not liked by the donors! Someone obviously didn’t get their kick back from the consultant! ! Its true there are some dreadful consultants kicking around but there are greater filters applied now than in the past and better background checks. Most projects/programs dont even start without good consultants involved in design and development of the project (concept, design, inception). These days almost no quality report (monitoring, program report, evaluation and progress report etc..) gets written without a good international consultant doing so. Projects/programs mean having an injection of substantial resources for a period of time to achieve a gain that should be sustainable (have achievable long term recurrent cost and resource implications). To do so you need good contract expertise. These are your development consultants. As noted there are bad ones around – but a good one can really make a difference. Try not to be so cynical. Interesting article, Very useful info that every organisation should have to know.Thank you for views..